The Irish international marathon runner’s healthy attitude to training helps him juggle a full-time teaching job with an elite athletics career. When Northern Ireland’s Kevin Seaward crossed the line fourth at this year’s Commonwealth Games marathon in the searing heat of the Gold Coast, it was the culmination of months of hard training through the freezing cold winter around his Leicestershire home. 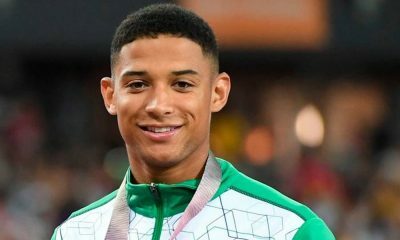 Working full time at a school near Leicester meant long spells at warm weather training camps were not an option for the 32 year-old, so Seaward made full use of the few weeks he had in Australia before the Games to acclimatise at the Athletics Northern Ireland holding camp, and ensured his training was as consistent as possible in the months leading up to the championships. The Belfast athlete is no stranger to competing on the world stage though. 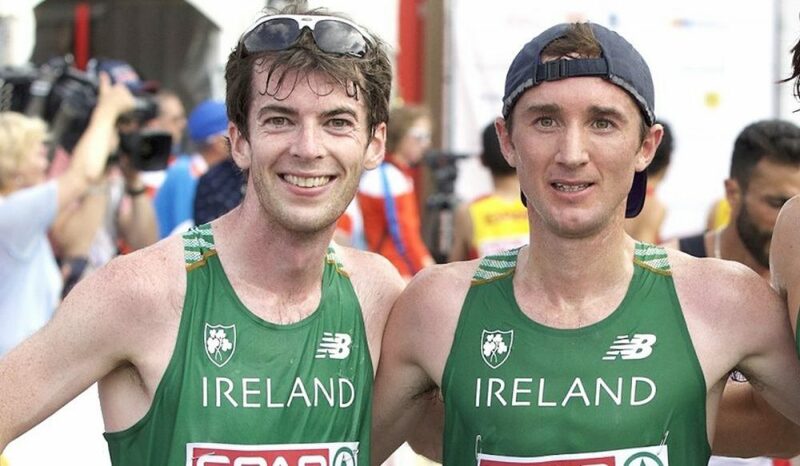 In 2016 he represented Ireland three times, running 65:23 at the World Half Marathon Championships in Cardiff, followed by the European Half Marathon Championships in Amsterdam – where he ran 66:20 to finish fifth European – and finished the year off on the biggest stage of all, running 2:20:06 in the Rio Olympics marathon. 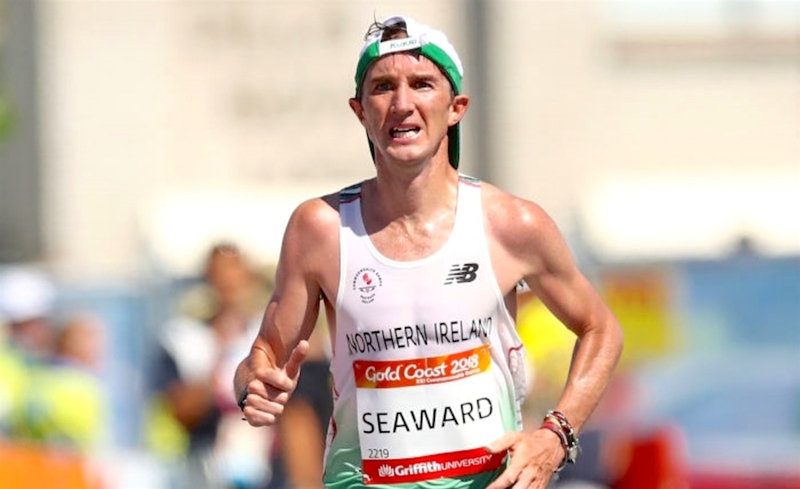 Seaward’s 2:14:52 PB secured at the 2015 Berlin marathon makes him the third fastest athlete from Northern Ireland behind the great Greg Hannon and Tommy Hughes, but undoubtably his 2:19:54 performance on the Gold Coast to finish just 18 seconds behind Scotland’s Robbie Simpson was his gutsiest race yet. 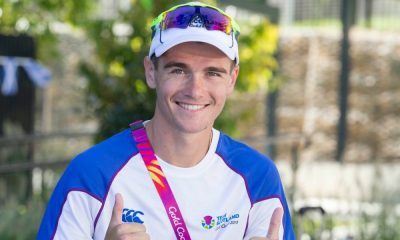 The Andy Hobdell-coached Irish star talked to Fast Running about his career so far, how he balances work and training at such a high level, and how important a part malt loaf plays in his nutrition plan. 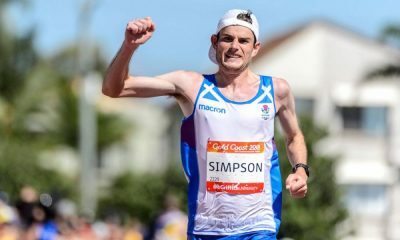 Fast Running: Congratulations on your Commonwealth Games marathon fourth place! Can you tell us about the whole experience? Kevin Seaward: I’d trained really well this marathon block and knew I was in a good place fitness wise. I have always been consistent in training and managed to maintain that even during the snow and winter weather. Going into the marathon I was planning towards a top eight finish. This was the target for Athletics Northern Ireland, given we had no finalists in athletics in 2014. I was ranked 16th I believe, so I knew I needed a good run. In terms of preparing for the heat, I did the bulk of the training in Loughborough. This meant there was no real strategy until I arrived in Australia a few weeks before the race. During long runs, I weighed myself before and after the run, included what I had drank during the run in order to work out how much I felt I needed during the marathon. It was a lot, and marathon day was going to be warmer – rising to 32 degrees Celsius! I deliberately held on to my bottles during the marathon until I had finished what was in them. I knew I would need it, particularly later in the race. I also made use of additional water stations to cool down – but was careful not to drink too much extra than what I had planned. For the first 15-20 miles it was all about being patient, not getting caught up in someone else’s rhythm, and from there it was about being confident. Knowing that I had a consistent block of training was the foundation for the confidence. FR: Congratulations also on your European Championships selection – how’re you feeling about returning to the city you ran your marathon PB? KS: European Championships 2014 is where things really got started for me. I was lucky after the Manchester marathon (where Kevin ran 2:18:46 on a course that was later found to have been measured short) to be selected as a discretionary pick by Athletics Ireland. It’s really nice to be returning to the marathon in 2018, and looking back at the last four-year cycle. Berlin is a great city and steeped in athletic history. Running a PB there in August is definitely something I want to do. I am hopeful the weather won’t be too warm but either way, smart running by the Irish athletes could see the team make a big impact in the marathon cup. FR: What’s next for you race wise this year? KS: At the moment I am very much focused on recovering ahead of the European Championships and adding some strength work (something I have never done before). 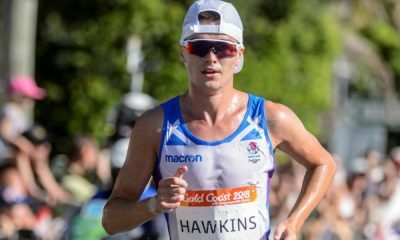 There isn’t a great deal of time between the Commonwealth Games and the European Marathon cup. Once I’m back into training I’ll look at a half marathon and a 10k in the buildup. The Notts 10, Wolverton 5 and Telford 10k (races that Kevin regularly runs and often wins) always come at nice times of the year for me. I have usually run an autumn or spring marathon and then use those races as a way of kick starting the next phase. All three are fantastic events on really nice courses. Notts 10 this year is a bit later in the summer so most likely not, but Wolverton 5 often features in my autumn return from marathoning. FR: Looking back on your athletics career so far, what stands out as a highlight? The Rio Olympic marathon, or a smaller race that represented a big step up? KS: I have a lot of great memories of racing as a young athlete back in Belfast for St Malachy’s College/AC. The Olympics and other championship races have been fantastic experience and I am grateful for every one of them. Winning my first schools cross country race is an important highlight for me though. I wasn’t particularly great at running at school and attending St Malachy’s College (Penn Relay DMR High School champions, 4 by 1500m world schools record holders) meant I was following in some big footsteps. I can always remember my school coach (Paddy McKillop, father of Irish middle distance Paralympian Michael McKillop) saying consistency was important, and, after putting together some really good training in school, I won the Ulster Schools Cross Country. The previous year I hadn’t even qualified past our area. My experiences at St Malachy’s helped develop the resilience and determination I think is needed to run a marathon. FR: You’re based in Loughborough, what’s it like training around there? KS: It’s a good location for training, and means I can meet up with other Midlands-based marathoners like Aaron Scott for key sessions. I have regular morning running partners like Frank Baddick (3:42 1500m), Stuart Spencer (2:19 marathon) and Nick Samuels (3:44 1500m) meaning most running runs aren’t lonely. FR: What do you do for a living, and how does training fit in around your work? KS: I’m a senior leader and teacher of PE at Martin High School in Anstey, a nice village outside of Leicester. Balancing work with running can be difficult. I often have early and late meetings, meaning I’m running before 6am and after 6pm. I can remember starting an 8 x 3km session at 8pm after a meeting. It is about time management and prioritising the right things at the right time. Thankfully Heather (Timmins, a 35min 10k athlete) my fiancée, is very understanding and Fionn, our dog, often joins me on runs. FR: You’re based in the Midlands but you run for Cardiff – how does that work with the club? KS: The Cardiff connection comes from my first coach in Loughborough, Alex Hains. In my first few years in Loughborough we had a fantastic Cardiff AAC group. We trained together most days. I also run for St Malachy’s AC, who again, have been great with their support. FR: You’ve been coached by Andrew Hobdell since 2015 – can you tell us a little about him and how he’s helped you progress? KS: I was introduced to Andy by fellow Irish marathoner Paul Pollock. Andy is great. He also works full time as a criminal lawyer, a father and an avid Arsenal fan. Andy invests a huge amount of time and effort in ensuring that each of his athletes gets what they need in order to progress. He has worked with a lot of international athletes and has coached athletes at the last three Olympic Games. Although there are common threads in training, often each athlete has their own areas to work on – Andy’s training makes sure you don’t neglect these areas. The methodical approach to individualised training is important, but enjoying the training is more important, and equally, you need to enjoy your running. I had lost the enjoyment and Andy reminded me that it should be fun. FR: Would you consider running more on the track or is the marathon and road your main focus now going forwards? KS: I am definitely more of a road runner these days, although I still don’t race as much as I should. The last few summers I have either been training for an autumn marathon or running a championship marathon. This means the track racing often misses out. I still train on the track and touch on most intensities in various stages of the training cycle. It’s not uncommon to be running 400s at 3k pace or 1km reps at 5k pace at different points in training. I have unfinished business at 5k and 10k, so I’ll be hoping to run personal bests over those distances in the near future. I am in some ways an accidental marathoner. I ran my first one to help pace a friend but when he got injured in the build-up I thought why not run the race anyway. It all progressed from there. FR: Clearly it’s key for any serious athlete to get their nutrition right, but particularly so for an international marathon runner. What have you worked out along the way that works for you nutrition-wise? KS: Nutrition is really important, but I don’t get hung up on the day to day worries of it. I make sure I get enough fruit and vegetables most days, and generally eat healthy evening meals. I am a big fan of porridge in the morning, and have it religiously all winter. It really sets me up for the day. At work, I’m lucky that the excellent catering staff include sweet potato on the menu, so that’s a standard lunch for me. Snack wise, I tend to navigate towards toast, but I’m also a big fan of apple Soreen malt loaf! In terms of ‘in-race nutrition’ I use mostly SOS and Powerbar gels, but switch to Maurten (sports drink) at 25 and 35km. I think these drinks and other commercial sports drinks have a role to play in good race and training nutrition, but it’s possible they’re overused by the public. I’m not entirely sure they are necessary for day to day use, and this is where I see them most. FR: Who helps you and supports you along your athletics journey, keeping you motivated, and grounded? KS: My family have always been really supportive. They aren’t able to travel to a lot of the competitions but I know they’re always tuned in. Heather, my fiancée, is also incredibly supportive. She comes along to most races. I try to repay the favour for her when she’s racing (Heather ran a 77:24 PB at this year’s Big Half Marathon in London to come 16th). Adidas have been very good at keeping me in shoes and training gear too. I am always grateful for that.